A picture of the bloodied prosthetic legs of Oscar Pistorius was shown at his murder trial on Thursday as his defence probed the State's apparent incomplete analysis of evidence. The right leg had blood streaks on it, and one of the grey ankle socks had a dark blood stain near the toes. Pistorius is on trial for murder after shooting dead his girlfriend Reeva Steenkamp in his Pretoria home on Valentine's Day last year. While the photographs of the double amputee's artificial legs were being sought, and as an official was scrolling through the photo files, a picture of Steenkamp, covered in blood and lying on the floor was seen on screens placed around the court to gasps from those who noticed it. The court has heard that only a shin was examined, with State forensic analyst Colonel Johannes Vermeulen explaining that the feet were not analysed because he had not been asked to do so. Vermeulen said he had received the legs without the socks. "It would have been fantastic as a qualified foot print examiner seeing that mark... to just do the test," said defence lawyer Barry Roux SC after a morning of tearing into apparent omissions in the forensic analysis conducted after Steenkamp's death. 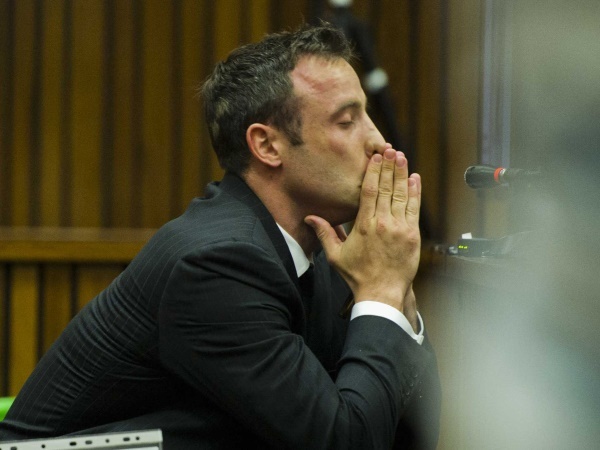 Pistorius has admitted that he fired four shots into a toilet cubicle at his home thinking there was an intruder, while he was on his stumps. When he realised it could have been Steenkamp he said he put his prosthetic legs on and kicked at the door to free her, then bashed it with a cricket bat until he could get to the key on the other side, according to his bail application statement. Vermeulen has told the court he believes the evidence shows Pistorius was still on his stumps when he hit at the door, based on measurements, but he left this theory out of his report. Pistorius has pleaded not guilty to murder and to Firearms Act charges relating to the alleged reckless discharge of a firearm in a public place. Once was allegedly at Tasha's restaurant in Johannesburg, the other allegedly out of a car driving through the Modderfontein area.